Shea Moisture is a worldwide brand that's been around as long as me (make that about 25 years), specialises in haircare and has around 70,000 followers on Twitter. They know what they're doing when it comes to using Shea Butter and natural organic ingredients. Shea Moisture has nearly 20 different collections of haircare products designed for different hair textures and types. There are quite a few that would suit my hair type but the one that stood out to me the most was the Raw Shea Butter range. A set of products designed to moisturise and repair dry, damaged and over-processed hair. Say no more! There's a few different products in each range, from different sized shampoos to conditioners and serums. 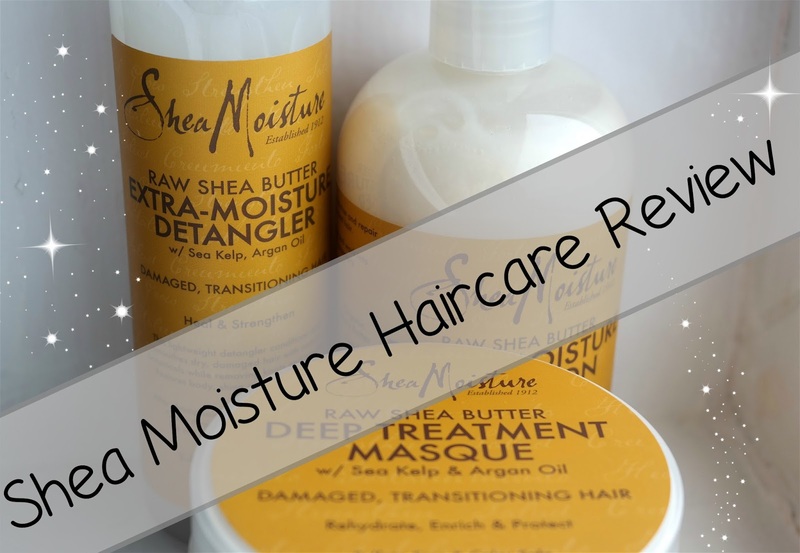 I put 3 products from the Raw Shea Butter range to the test: shampoo, detangler and masque. These 3 products make a good hair routine helping to transition my chemically treated hair to healthy natural hair. This organic, sulphate-free shampoo is packed with Argan oil, Shea Butter and Sea Kelp and aims to increase elasticity, seal cuticles and restore radiance. If you've ever used a sulphate-free shampoo you'll know they don't lather very much but this one actually left my hair feeling clean. I'm not keen on the packaging, I tend to prefer a shampoo that's got a pump but that's a pretty small grumble to have. When you've got dyed, heat processed hair it's going to take more than a few washes to have completely healthy hair but I feel like my hair is healthier. When I come out of the shower I've sometimes got a bit of a battle brushing my hair and fixing my parting, especially if I've towel dried my hair. I used to rely on leave in conditioners and I've used a few kids detanglers too. This is the first cream/gel one that I've used in a while and I was a bit wary putting it through my hair from roots to tips. Because you don't wash it out I was worried about it leaving my hair feeling greasy or weighed down. Like the other Raw Shea Butter range it's got Argan Oil and Sea Kelp which helps make my hair manageable and not so knotty and unruly. There's a tiny chance my Tangle Teezer could be put to early retirement with this stuff. I don't like to use too much product in my hair so I don't think I'd use this after every wash but it definitely helps sort out any birds nest situations. I love a deep treatment product, I use them like regular conditioners. I think it's a dyed hair thing. I was expecting this to be a thick cream but it's actually a bit more solid - like a body butter. It's packed with Argan Oil, vitamins A and E and Sea Kelp extract. These ingredients are what help to smoothen, soften and strengthen hair. When I've used it I've left it in for up to 5 minutes in the shower but I reckon it would be a good one to leave in your hair out of the shower for around 20 minutes. I've noticed a different after just a few washes. Unfortunately blonde hair doesn't show much of a shine but it's definitely smoother. I don't feel like I need to straighten my hair after drying it to make it look less frizzy. A lovely deep conditioning masque and good alternative to conditioner.